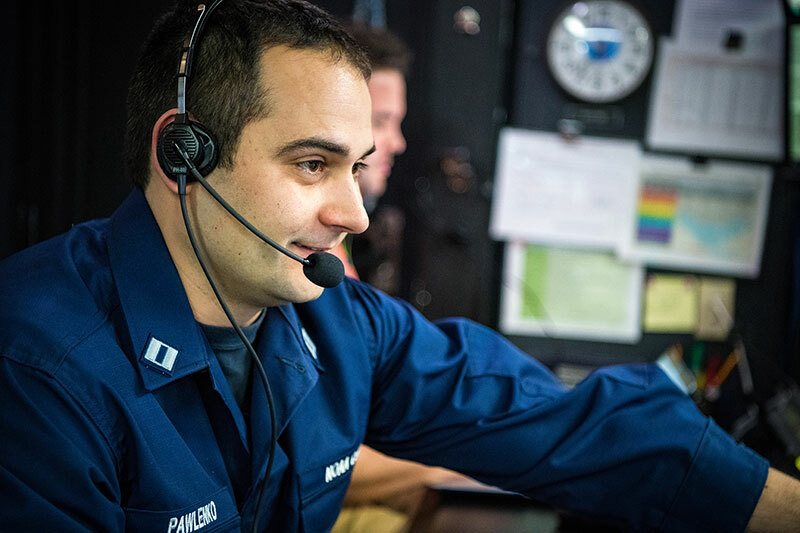 LT Nick Pawlenko, the Gulf of Mexico 1803 Expedition Coordinator, hard at work in the control room aboard NOAA Ship Okeanos Explorer. Image courtesy of the NOAA Office of Ocean Exploration and Research, Gulf of Mexico 2018. Download larger version (jpg, 1.9 MB). I grew up in Pennsylvania where I was constantly around water. My family’s boat, time as a boat lackey for boat rentals, lifeguarding, competitive swimming, and background in Mechanical Engineering all led me to focus my career on the ocean and evenutally led me to become a Commissioned Officer with the NOAA Corps in January 2013. The smallest of the seven U.S. uniformed services, NOAA Corps has active-duty officers who can be found operating NOAA’s ships and aircraft to meet NOAA’s priorities and fulfill its mission of science, service, and stewardship. I have spent three field seasons aboard the Okeanos Explorer as a NOAA Corps officer and have sailed from Rhode Island to the remote Pacific. In recent years, the Ocean Exploration Advisory Board, which advises NOAA leadership on strategic planning, exploration priorities, competitive ocean exploration grant programs, and other matters, recommended that NOAA focus on the Gulf of Mexico for upcoming exploration work upon completion of the Campaign to Address Pacific monument Science, Technology, and Ocean NEeds (CAPSTONE). 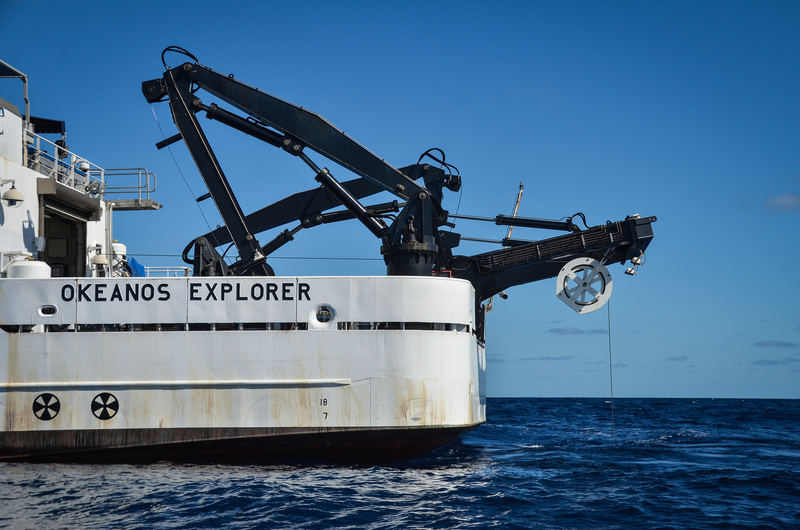 NOAA Ship Okeanos Explorer in the Gulf of Mexico. Image courtesy of the NOAA Office of Ocean Exploration and Research, Gulf of Mexico 2017. Download larger version (jpg, 3.3 MB). Even though the Gulf of Mexico is very close to land and the area has experienced a significant industrial footprint, there is still much to explore and discover. There are a wide range of habitats and fascinating geological features that I look forward to seeing during our dives. In addition, the area has a rich history of shipping and many submerged cultural heritage sites that remain unexplored. While planning for the expedition, we worked with scientists and managers from NOAA, the region, and the broader ocean science community to identify priority areas for exploration and ROV dive locations. This process ensures that the data NOAA Ship Okeanos Explorer collects is of high value to a variety of people. For example, resource managers are interested in Essential Fish Habitats and Habitat Areas of Particular Concern. We also had the opportunity to work with Boston College undergraduate students, who helped us to identify a dive site. We look forward to sharing additional details about this project and more during our expedition! 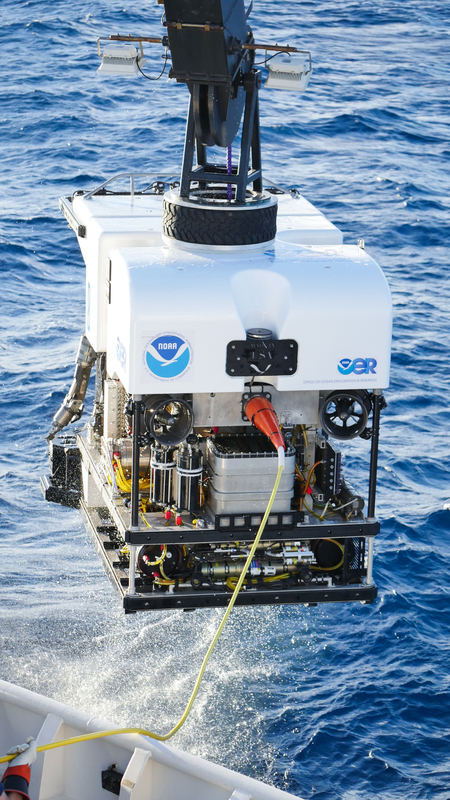 ROV Deep Discoverer in the Gulf of Mexico. Image courtesy of the NOAA Office of Ocean Exploration and Research, Gulf of Mexico 2017. Download larger version (jpg, 6.8 MB).